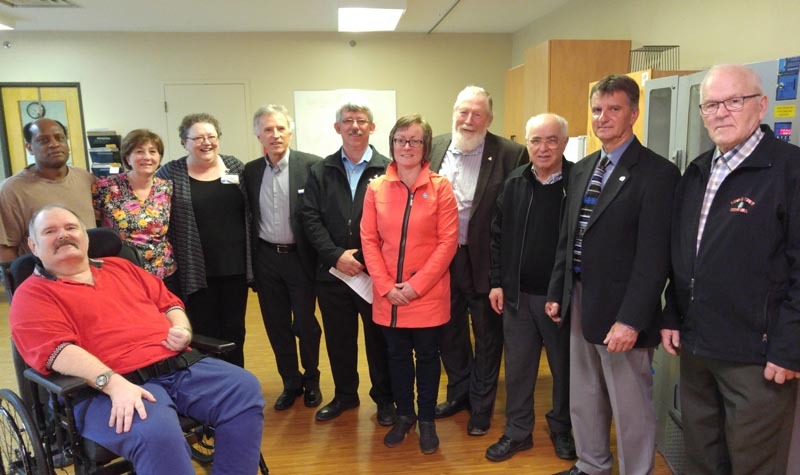 Northumberland-Quinte MPP Lou Rinaldi (pictured third from right) was at Pleasant Meadow Manor on May 4 to announce the province will be funding an additional 35 beds at the Norwood long-term care home. The expansion is slated to be complete by December 2022. NORWOOD, Ont. – OMNI Health Care is excited to announce that three of its long-term care homes serving small communities – Pleasant Meadow Manor, Woodland Villa and Almonte Country Haven – were approved for redevelopment by the Ministry of Health and Long-Term Care last week. Thanks to the funding, Pleasant Meadow Manor (in Norwood) will get 35 new beds, Woodland Villa (in Long Sault) will be awarded 17 beds and Almonte Country Haven (in Lanark County) will be adding 14 beds. The expansions of these homes are expected to be complete by December 2022. OMNI president and CEO Patrick McCarthy says the redevelopment of these homes will better prepare the small communities they serve for an increase of people needing long-term care. The announcements to expand these homes comes on the heels of an April 23 funding announcement from the province that a new 160-bed Riverview Manor will be opened in the north end of Peterborough by 2022. Northumberland-Quinte MPP Lou Rinaldi was among dignitaries at Pleasant Meadow Manor on Friday (May 4) to make the announcement for that home’s redevelopment plan. “This is an incredible opportunity for expansion to Pleasant Meadow Manor and will drastically increase the facility’s capacity, making way for more support to our aging population,” Rinaldi says. The Ontario government introduced a long-term-care-home renewal strategy in 2014 as a multiyear plan to support the renewal of 30,000 beds by 2025. OMNI has long supported the goal of rebuilding and modernizing older long-term care homes in Ontario, McCarthy says. Rebuilding and renovating homes will provide more comfortable, home-like rooms and amenities, enhance care and provide greater dignity for residents and families, he adds. Newer homes will also offer wider hallways, smaller resident home areas, more storage and quieter, more home-like dining and lounge spaces. Privacy for residents will be improved through the elimination of three- and four-bed wards. Pleasant Meadow Manor administrator Sandra Tucker says she’s “excited” about the opportunities expanding the home will have for the local community.